If you’re a person that uses their bicycle often, likely you’ve been caught in the rain before. If you’re one that enjoys your music, that can run into a bit of a problem for your speaker and MP3 player. Well this speaker will allow for you to keep your music playing and still keep it protected from the water. With this speaker you’ll also still be able to hear the traffic for safety reasons, unlike just using a set of headphones. 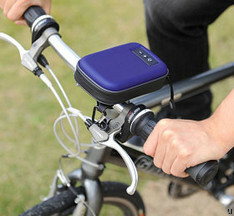 The speaker case mounts to the handlebars on your bike. It has a built-in speaker within the case, then once it’s unzipped it reveals a pocket just for your MP3 player. That pocket will hold and protect MP3 players ranging in size from the tiny on up to an iPod Touch. To turn the volume up and down the controls are on the outside of the case. The case can also be clipped to your belt loop instead of the handlebars. It will cost you ¥3,980 or about $44.